Riverbed built its brand and reputation around solving the challenges of the wide-area network (WAN). For over a decade we’ve been helping our customers deliver applications more efficiently across WANs while also expanding our portfolio to include the most comprehensive suite of application performance solutions to provide visibility, performance, agility & security for businesses and IT departments. At the beginning of this year, we continued investing in our approach with the acquisition of Ocedo, a software-defined WAN (SD-WAN) provider, to accelerate and expand our SD-WAN portfolio. As we work to integrate Ocedo innovations with our existing technologies, we want to take the covers off of our plans and share our vision and strategy for delivering SD-WAN with the world. Join us on April 26th or 27th for live webcasts where we will discuss our SD-WAN vision and demonstrate our new solutions. Brad Casemore, Research Director at IDC will join us to share his views on the SD-WAN market and adoption. We’ll also have Riverbed leaders including Paul O’Farrell, SVP & GM and Subbu Iyer, CMO who will share details on Riverbed’s SD-WAN vision & strategy. Learn why your legacy WAN infrastructure is ripe for modernization in a hybrid world. We’ve seen software-defined networking (SDN) technologies discussed and start to be deployed by early-adopters over the past few years. Much of the focus has been on the data center where SDN and network virtualization have started to deliver automation and some operational and cost benefits. There’s been a realization that much of the cost and complexity typically associated with WANs—including the connections such as costly MPLS links and the hardware to connect them—CLI-managed hardware routers, are ripe for disruption. 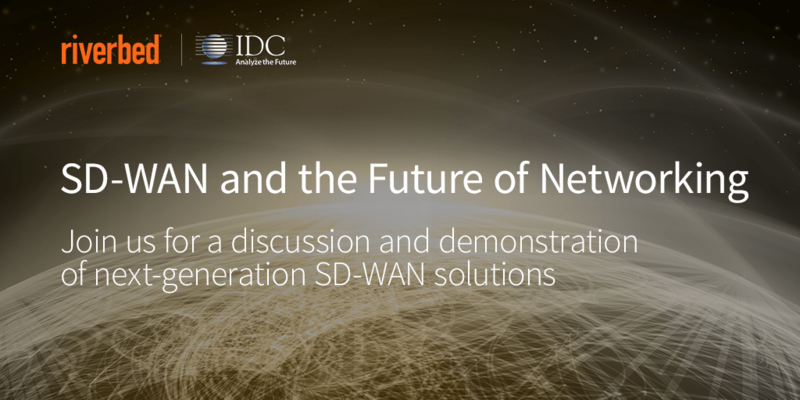 SD-WAN holds the promise of unlocking more value from WAN investments and revolutionize application delivery across long distances. Remember to register for the webcast!